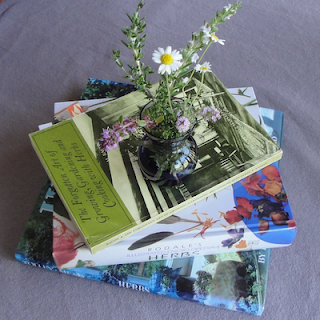 I have a growing collection of beautiful gardening books thanks to my favorite used bookstores. Once I discovered that their gardening sections are usually well stocked with great books, I’ve been padding my own shelves at home with some gems at low cost. Some are no longer in print, so that's another reason to spend time browsing in these shops. Some of my best finds are herbals, books on growing and using herbs. Herbs are essential in my garden for cooking and for brewing teas. 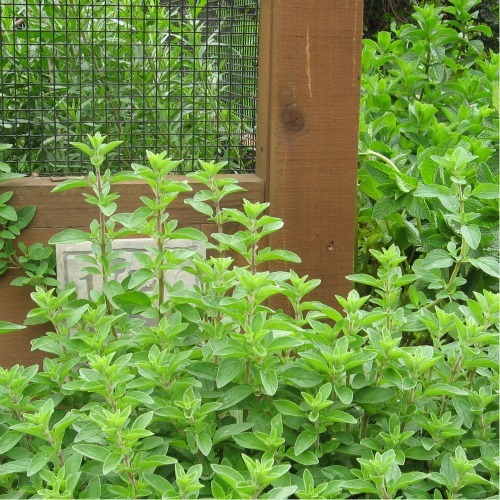 I’ve written previously about their benefits to the garden ecosystem. And these books don't get outdated. This is knowledge that has been gathered and passed down through generations that will always be useful. 1. The Forgotten Art of Growing, Gardening, and Cooking with Herbs, by Richard M. Bacon, 1972, Yankee INC. This medium-sized paperback book is packed with information about kitchen herbs, including how to design herb gardens and how to grow herbs indoors in restricted spaces. It has numerous short recipes (no detailed cooking instructions) and a chart for which herbs to pair with specific foods. There are also recipes for making skin creams, scented oils, and even how to use them as pesticides. Interestingly, this book is one in a series of “The Forgotten Art of…” books (others are: Building a Good Fireplace, and Building a Stone Wall!). 2. Herbs: Gardens, Decorations, and Recipes, by Emelie Tolley and Chris Mead, 1985, Houston Home and Garden. This is a gorgeous book that is up there in the coffee-table-book category. It’s a hefty hardcover in a large format, and full of glossy color photos. The authors feature forty herbs for the garden with a paragraph or two about each, but the generous amount of photos of featured gardens across the country (plus one in England) make this a perfect book to curl up with and savor. The authors showcase different herb gardens, from cozy and quaint to formal, and discuss design ideas. Detailed recipes beautifully photographed are another plus. The back of the book has a directory of herb shops and gardens. I’m glad I didn’t have to pay full price for this one! 3. Rodale’s Illustrated Encyclopedia of Herbs, Claire Kowalchik and William H. Hylton, editors, 1987, Rodale Press. Wow. This is my hands-downs favorite reference book, probably influenced by the fact that it was my father’s book. My hardcover copy has over 140 herbs. Each entry includes historical anecdotes as well as uses, cultivation, drawings and photos. 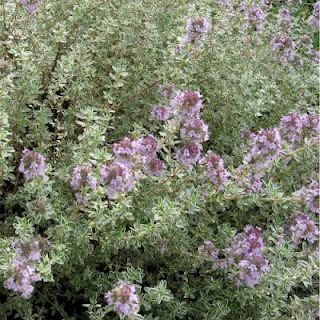 The descriptions of the herbs are very thorough, and include detailed horticultural notes describing the leaves and flowers, growing zones, and Latin names. Besides charts for pairing with food, this book has sections on herbal botany, a history of herbs, and the use of herbs in healing. 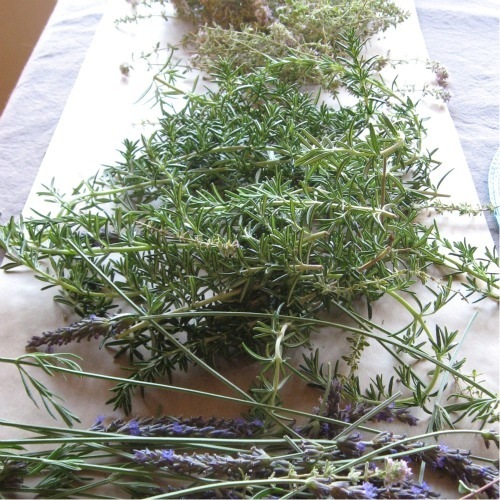 This one is a must for anyone interested in herbs. 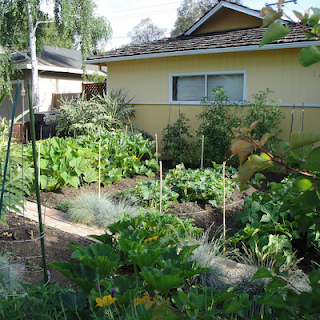 This is my third year as a volunteer organizer for the annual Edible Landscaping Tour organized by Common Ground Organic Garden Supply and Education Center (Saturday July 21, in the SF Bay Area - register here ). Seasoned gardeners know that besides getting your hands in the dirt, the best way to learn about gardening is from other gardeners. 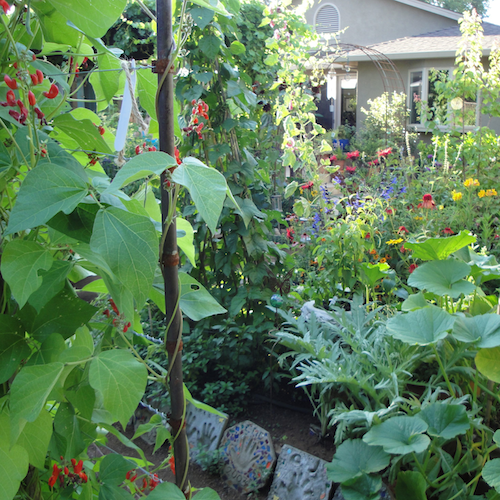 This summer consider going on an edible gardens tour, even if you have to organize it yourself. Summer is the perfect season to visit local gardens and get tips and ideas directly from the gardeners themselves. The goal is to see a diversity of approaches to landscaping with edibles, and to come away with great ideas that you can adapt to your situation. But if you can’t find a tour in your area consider organizing an informal garden tour in your neighborhood. Most avid gardeners love to show their gardens and share their experiences. All you have to do is ask. 1. Decide what features the gardens should have to make the cut for your tour: organic practices only? examples of wise water use, composting, etc? edibles in both the front and backyards? 2. Location and scope: will it be restricted to walking or biking distance only? carpooling? Who will attend? 3. Send out a call for gardens through your neighborhood newsletter or community bulletin boards (both virtual and actual) and social media. Do a walk-around or bike ride to spot gardens with edibles in the front yard. Chances are good that they have more in the backyard. 4. When you've found eligible gardens and willing hosts, visit each garden to make sure it fits your expectations for your tour. 5. Be clear on what the garden hosts are expected to do, such as answering questions and explaining their approach to growing food. 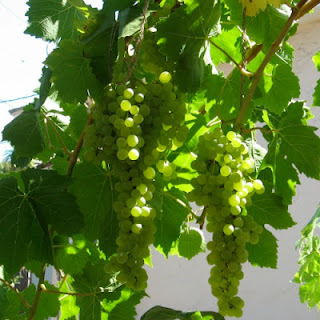 Of course, they must be willing to have a certain number of people traipsing though their garden on the appointed day, and commit to being available at the time of the tour. 6. Organize your tour as far in advance as possible. Enthusiastic gardeners will want to showcase their gardens in the best possible manner so having lead-time to plan is appreciated, plus you'll need time to get the word out to recruit attendees. 7. For an informal tour you can visit the gardens as a group within a neighborhood, one garden at a time. Make sure everyone knows ahead of time how much time will be allotted at each stop. It’s easy to get carried away and spend too much time at one garden and not have enough left for the others! 8. If your tour is larger in scope and you have lots of attendees planned, arrange to have a pre-tour in advance for the gardeners showing their gardens, so that they’ll have a chance to visit each other’s gardens. 9. For a neighborhood tour a potluck or tomato tasting is the perfect way to end the event and have more time to socialize. 10. Plan for next's year's tour: keep a list of the current participants and another list for gardens for the following years' tour. Gardeners who couldn't participate this time may be willing and ready next year. Create an online photo album to share and encourage the participants to post their photos and comments. The 6th annual Edible Landscaping Tour organized by Common Ground Organic Garden Supply and Education Center takes place on Saturday July 21st, from 11am to 4pm. This tour is located on the San Francisco Peninsula and is a fantastic one day tour of ten local gardens that feature landscaping with edibles and gardening by sustainable methods, including: composting, wise water use, and even raising chickens for eggs and manure. This popular event attracts hundreds of attendees each year. Soup? 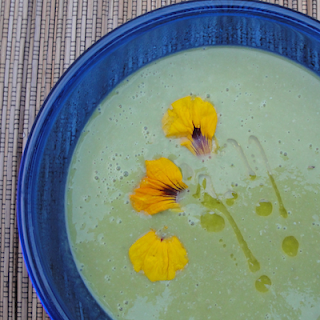 Don’t despair if you are sitting in June heat- this delicate soup is tasty served cold too. You can still find fresh peas to shell for this lovely simple soup at your farmer’s market if you don’t have any in your garden. This is a very easy recipe with just a few ingredients, and the most challenging part is getting all of those peas shelled. You may want to recruit some help. It would be a perfect opportunity to shell peas with a friend and catch up during the process. You might even be able to get some kids to help and show them where peas come from (besides a bag in the freezer!). 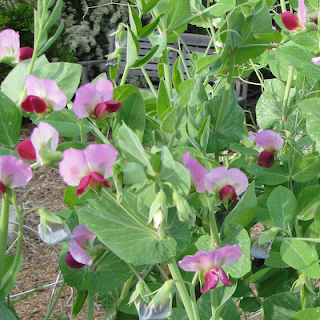 When I finally harvested the last of my heirloom DwarfGray Sugar peas I had about two pounds of podded peas. I couldn't wait to make a fresh pea soup now that I had enough peas. We have enjoyed the mildly sweet fresh peas all spring, either shelled and raw in salads, or lightly cooked with pasta, or mixed with vegetables. 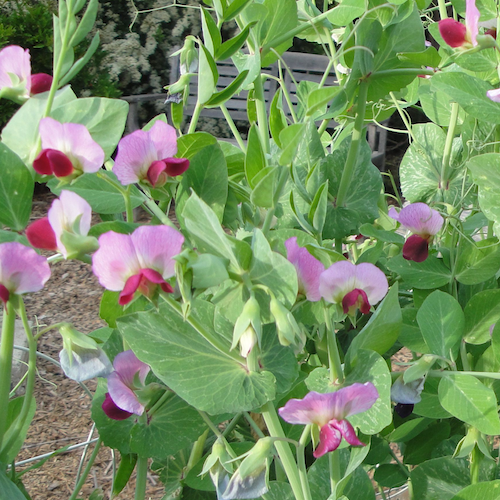 I let the peas get big in the pod, so I could shell them, but this variety is also eaten as a very young tender pod. 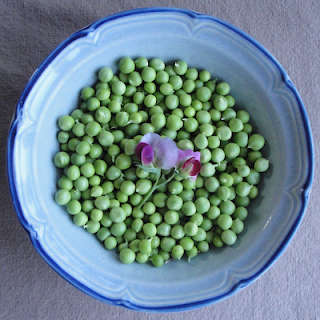 I recommend sugar peas versus English peas, which are very starchy. I don’t know how this recipe would turn out with that variety. 1. Heat 2 -3 tablespoons of olive oil in a heavy pot and gently sauté the onion with the thyme sprigs. 2. When the onions are soft (don’t brown them) remove the thyme and carefully add 5 cups of water and ½ teaspoon of salt. 3. Bring this to a boil and add the shelled peas. Simmer for a few minutes until they are just tender. 4. Remove the pot from the burner and use a stick blender to puree the soup until it is silky smooth. Careful with splashing, as per usual. Serve immediately or chill and serve cold. A garnish of edible flowers with a drizzle of extra virgin olive oil is a pretty and elegant touch. I used nasturtiums which add brilliant color and just a hint of peppery spice. This recipe was adapted from Alice Water's method in The Art of Simple Food, a book I highly recommend. 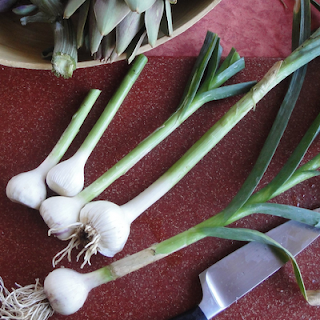 Green garlic, also called spring garlic, is a seasonal specialty. 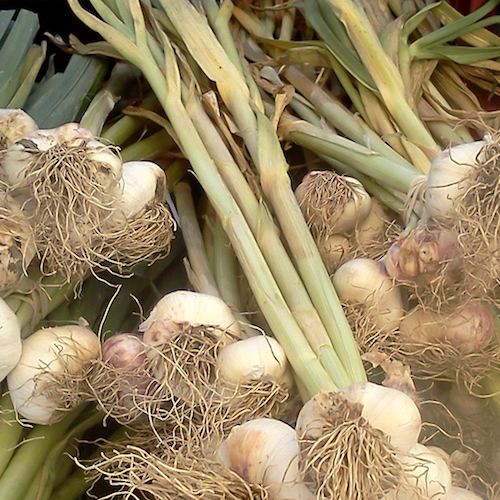 Try its delicate mild garlic flavor and you'll add it to your list of springtime favorites. Green garlic is garlic that is harvested before it fully matures and is not cured as regular garlic bulbs are. Farmer's markets and CSAs now have it as part of the season's offerings, but the season is short. Green garlic can have a partially formed bulb, or look more like a green onion. A simple way to enjoy it is sauteed to add garlicky flavor to fresh vegetables; I love it with braised artichokes which are also in season. Use it as you would a leek, that is, trim off any parts of the stalk or bulb that are tough and not tender, then saute gently in olive oil on low heat. Add fresh vegetables that have been cooked just until tender and saute a few more minutes. Season with salt and pepper and serve as a side dish, or toss with pasta. See more recipes in this NY Times post. If you grow garlic in your garden you can easily harvest some of your crop in April to May before it flowers. 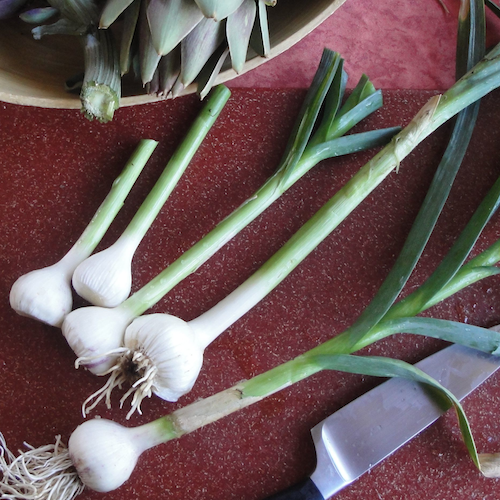 I now harvest all of my garlic early since it's easy to find good garlic bulbs any time of the year, but it's a special treat to have really fresh spring garlic. 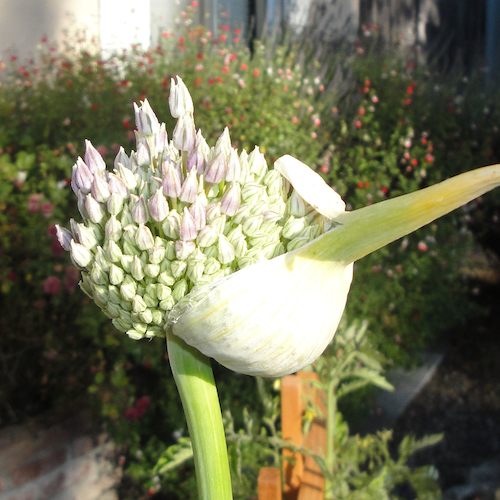 Elephant garlic is huge, including the flowers! 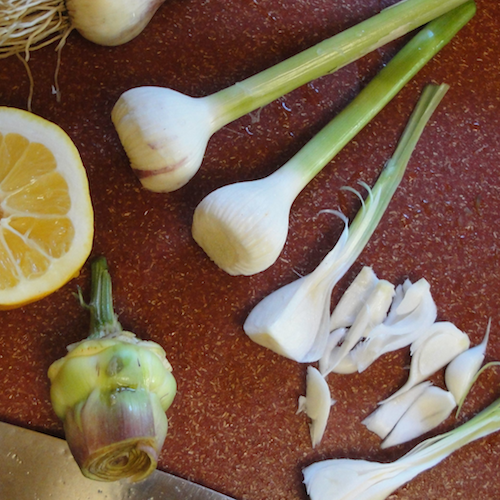 Last fall I planted huge cloves of Elephant garlic from my farmer's market, then harvested them in April as green garlic. The super-sized bulbs grew very well and were wonderfully tender and delicious by this spring. But I couldn't resist letting one of the plants flower (photo above). It was just too spectacular to miss!